The robotic force has awakened in Asyraf Abdul Rahman’s eyes. He has dared to invest in R&D to come out with mobile robots which can move materials in a factory or warehouse. With rising labour costs, he sees industrial robots and factory automation as the way forward to compete globally. 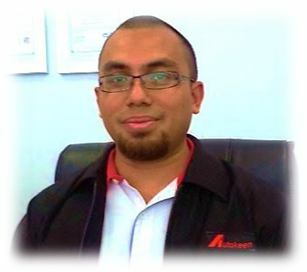 VEE-13 Member Asyraf Abdul Rahman, Managing Director of Autokeen Sdn Bhd, exemplifies a new breed of manufacturers. Instead of just making products designed by others, he sees the future in home-grown technology and robotics. Walking the talk, the trained engineer set up subsidiary company Ideasparq Robotics Sdn Bhd in 2012 to create made-in-Malaysia Automated Guided Vehicles (AGV). An AGV is a mobile robot that follows markers or wires in the floor and uses magnets or lasers for navigation. These robots move materials around a manufacturing facility or warehouse. Ideasparq Robotics created its first model from scratch in two years and has sold RM1.5m worth of AGVs in 2015. A second generation leader, Asyraf took over from his late father who started Autokeen Sdn Bhd 30 years ago. The company has a stable business, producing metal parts for local and foreign car makers like Proton and Toyota. He understands the limited scope of contract manufacturing or making products for others. “Prices have become the main point for selling. So to get the manufacturing edge, we need technology to make our own products”, he explains on why he went into robotics. On top of this, he adds that there is a need to cope with rising labour costs since Malaysia has started implementing minimum wage. He thinks that wages will keep on increasing as the country progresses. Therefore industrial robots and factory automation in manufacturing make business sense. Asyraf has been a Vistage member for 10 years and believes that being exposed to various industries and different bosses’ perspectives has helped him to see the bigger picture in his business . “Even if the issues are not in manufacturing, I still learn from them,” he says. Also invaluable to Asyraf is the support from his Chair Tee Lee Meng. “In our one-to-one session, he always sees things which I don’t see,” he acknowledges. He notes that this extra viewpoint has helped him in many ways such as negotiating deals with customers and making decisions on bonuses. In addition, his Chair has taught him the art of people management, notably how to motivate his team. At Ideasparq Robotics, Asyraf had to motivate his team of 10 to build from scratch, instead of importing or copying existing models in the market. He worked with his partner who is also passionate about robotics and a group of young graduates in Mechatronics from the International Islamic University Malaysia. Though the development phase was difficult, Asyraf believes that it was worth it. “Because we went through the process and built from scratch, our skill sets are stronger,” he asserts. There were a lot of challenges, trials and errors in creating the first commercial model. Asyraf recalls that his Chair advised him to focus on what customers want. “Initially, we wanted to create an AGV with all the bells and whistles, but after talking to customers, we realised they wanted something easy to manage and maintain,” he reveals. The first magnetic AGV model was completed in 2014, using all locally made components except sensors and motor drivers. Its proprietary real-time software (wireless monitoring and control) and micro-controllers made the AGV 60% cheaper than imported ones. Asyraf sees good sales prospects as these robots are used in many industries such as automotive, paper & print, chemicals, food & beverage and hospitals. Currently, he faces only one local competitor. Asyraf’s foray into robotics has caught the eye of external parties. At the World Islamic Economic Forum Idealab 2015, Ideasparq Robotics won the first prize among 20 other start-ups. Their AGV impressed venture capitalists who were judges for the competition for the best start-up company among Islamic countries. Following this, the Multimedia Development Corporation (MDeC) has given his company a RM300,000 grant to develop another automation-related product. In the coming year 2016, Ideasparq Robotics will focus on increasing production volume of AGVs and expanding sales to Penang, Johore and Singapore. Asyraf plans to widen the net to Asean countries in 2017. He is also planning to upscale after-sales service and to delve further into development of new products. In the next five years, Asyraf envisages big shifts in manufacturing with more automation and artificial intelligence in robots. He foresees robots which can “learn” to do things faster and is gearing up to meet the challenges. “We have to follow the wave to compete globally,” he concludes.